2Amit M, Canadian Paediatrics Society. 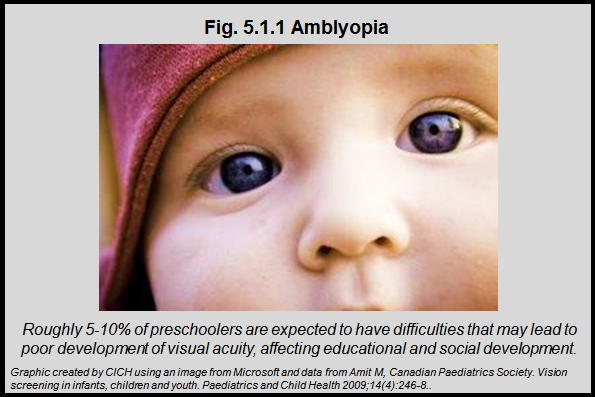 Vision screening in infants, children and youth. Paediatrics and Child Health 2009;14(4):246-8. 3Canadian Task Force on Preventive Health Care. New grades for recommendations from the Canadian Task Force on Preventive Health Care. CMAJ 2003; 169:207-8. 4Chou R., Dana T., Bougatsos, C. Screening for Visual Impairment in Children Ages 1 – 5 Years: Systematic Review to Update the 2004 U.S. Preventive Services Task Force Recommendation. Evidence Synthesis No. 81. AHRQ Publication No. 11-05151-EF-1. Rockville, MD: Agency for Healthcare Research and Quality; February 2011. 5Mema SC, McIntyre L, Musto R. Childhood vision screening in Canada: Public health evidence and practice. Canadian Journal of Public Health 2012;103(1):40-5.